Is Applying Or Removing That Cervical Collar Dangerous? Cervical collars are applied to blunt trauma patients all the time. Maybe a bit too often. And most of the time, the neck is fine. It’s just those few patients that have fracture or ligamentous injury that really, truly need it. I’ve previously written about how good some of the various types of immobilization are at limiting movement (click here). But what happens when you are actually putting them on or taking them off? Could there be dangerous amounts of movement then? Several orthopaedics departments studied this issue using an electromagnetic motion detector on “fresh, lightly embalmed cadavers” (!) to determine how much movement occurred when applying and removing 1- and 2-piece collars. Specifically, they used an Aspen 2-piece collar, and an Ambu 1-piece. They were able to measure flexion/extension, rotation and lateral bending. There was a significant difference (of 0.8 degrees) in flexion/extension between the two types (2-piece flexed more). Really? 0.8 degrees is significant? Not clinically! Bottom line: Movement in any plane is less than 3-4 degrees with either a 1-piece or 2-piece collar. This is probably not clinically significant at all. Just look at my related post below, which showed that once your patient is in the rigid collar, they can still flex (8 degrees), rotate (2 degrees) and move laterally (18 degrees) quite a bit! So be careful when using any collar, but don’t worry about doing damage if you use it correctly. Reference: Motion generated in the unstable cervical spine during the application and removal of cervical immobilization collars. J Trauma 72(6):1609-1613, 2012. Soft collar – In general, this decreased rotation by 8 degrees but insignificantly protected against flexion and extension. Basically, this keeps your neck warm and little else. Hard collars – A variety of collars available in that era were tested. They all allowed about 8% flexion, 18% lateral movement, and 2% rotation. The Philadelphia collar allowed the least extension. Sandbags and tape – Surprisingly, this was the best. It allowed no flexion and only a few percent movement in any other direction. The Mayo clinic compared four specific hard collars in 2007 (Miami J, Miami J with Occian back, Aspen, Philadelphia). They found that the Miami J and Philadelphia collars reduced neck movement the best. The Miami J with or without the Occian back provided the best relief from pressure. The Aspen allowed more movement in all axes. And finally, the halo vest is the gold standard. These tend to be used rarely and in very special circumstances. For EMS: Rigid collar per your protocol is the standard. In a pinch you can use good old tape and sandbags with excellent results. For physicians: The Miami J provides the most limitation of movement. If the collar will be needed for more than a short time, consider the well-padded Occian back Miami J (see below). 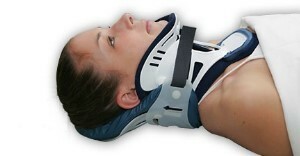 Efficacy of cervical spine immobilization methods. J Trauma 23(6):461-465, 1983. Range-of-motion restriction and craniofacial tissue-interface pressure from four cervical collars. J Trauma 63(5):1120, 1126, 2007. Cervical collars are applied to blunt trauma patients all the time. And most of the time, the neck is fine. It’s just those few patients that have fracture or ligamentous injury that really need it. There was a significant difference (of 0.8 degrees) in flexion/extension between the two types (2-piece flexed more). Really? 0.8 degrees? They are the cliches of the courtroom. The defendant appears before the jury with a cane, a cast, and a soft cervical collar. Looks good, but are they of any use? There are really two questions to answer: does a soft collar limit mobility and does it reduce pain? Amazingly, there’s very little literature on this ubiquitous neck appliance. First, the mobility question. It’s a soft collar. It’s made of sponge. So it should be no surprise that it doesn’t reduce motion by much, about 17%. But it is better than no collar at all. What about pain control? One small retrospective review looked at the effect of a soft collar vs no collar at all on pain after whiplash injury. Keep in mind that the definition of “whiplash” is all over the place, so you have to take it with a big grain of salt. But the authors found that there was no difference in subjective pain scoring with or without the collar. Another much older study (1986) compared a soft collar with active motion after whiplash. Subjects who actively moved their neck around had less subjective pain after 8 weeks. Bottom line: The soft cervical collar keeps your neck warm. Not much else. And in my experience, prolonged use (more than a few days) tends to increase uncomfortable neck spasms. So use them as an article of clothing in Minnesota winters, but not as a medical appliance. Inline stabilization vs inline traction! A comparison of neck movement in the soft cervical collar and rigid cervical brace in healthy subjects. J Manipulative Physiol Ther. 34(2):119-22, 2011. The effect of soft cervical collars on persistent neck pain in patients with whiplash injury. Acad Emerg Med. 3(6):568-73, 1996. Early mobilization of acute whiplash injuries. Br Med J (Clin Res Ed). 292(6521):656-7, Mar 8 1986. The Soft Cervical Collar: A Piece of Junk?